Description: In The Annotated Hobbit, Tolkien’s description of Gollum was compiled from multiple sources as follows: "a slimy little creature, not larger than Bilbo: thin, with a large head for his size; large, protuberant eyes; a long, skinny neck; and thin, lank hair. His skin was very white, and evidently he work black garments [with pockets]. (He was never naked). His hands were long and his feet were webby, with prehensile toes." 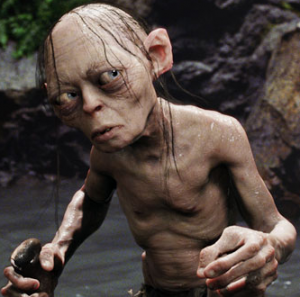 Gollum lived for nearly 600 years due to the effects of possessing the Ring. He was born near the banks of the Great River, Anduin, and raised by his grandmother. He is believed to have been in his early twenties when he murdered Déagol (presumably a relative, though this is never stated) to get the Ring, which Déagol had found in the Anduin. The Ring amplified his evil tendencies and he took to spying and stealing. His family expelled him from their dwellings, and he made his way into the Misty Mountains, where he lived by a subterranean lake for more than 400 years, until he met Bilbo Baggins. This encounter is the subject of just one chapter in The Hobbit, in which Bilbo, lost in the caves after escaping the Goblins, wagered his life against guidance out of the depths in a riddle-game with Gollum. Bilbo won, Gollum tried to renege on their agreement, but Bilbo, having found the Ring without at first knowing its nature, was able to use it to escape. Gollum’s screams of hatred are the last readers hear of him in that book. After a few years, Gollum left the Misty Mountains to search for Bilbo and the Ring, but following more than 30 years of journeying he was captured near Mordor and tortured by Sauron, who released him almost 40 years later. He was quickly re-captured by Aragorn, who was seeking him for Gandalf to question, and held by the Wood-elves in Mirkwood. Gollum escaped the Elves when they were attacked by Orcs. He journeyed from there to Moria, whence he followed the Fellowship on their quest to destroy the Ring, eventually serving as Frodo Baggins and Samwise Gamgee’s guide to Mordor. He fell to his death with the Ring at the Cracks of Doom. Analysis: In The Hobbit as first published, there are no indications that Gollum is physically like Bilbo, and some early illustrators assumed he was more monstrous, and large enough to eat Bilbo at a sitting, as the text implies. Only in later editions is he described as “small”. In LOTR he is described as being “of Hobbit-kind”, while in a later letter (#214) Tolkien specifically refers to him as a Hobbit. Even in The Hobbit, the name “Gollum” is identified as an epithet, earned from his habit of making a “horrible swallowing noise”. The text adds that “he always called himself ‘my precious'”. (In later editions of The Hobbit and in LOTR, Gollum also uses that term to describe the Ring.) LOTR explains that his given name is “Sméagol” (Old English “burrowing, worming in”) which is in turn meant to be Tolkien’s “translation” of “Trahald”. Gollum actually meant to give Bilbo his magic ring in the first edition of The Hobbit, as a prize for winning the riddle-game. When Gollum could not find it (because Bilbo already had), he apologetically showed Bilbo the exit. This was changed for the 1951 edition, and the original story is explained in LOTR as being Bilbo’s invention, meant to justify his ownership of the Ring.